Finally, I own a bread maker – Panasonic – SD-PM105. Thanks to my Tai Wai family for the birthday gift and the 1st loaf of bread which I’ve made was soft bread, using the recipe which came with the manual. It turned out well. It’ll be even better if it’s more dense. I’ll need to figure that out! This is the 2nd recipe which I’ve tried and it turned out pretty well. 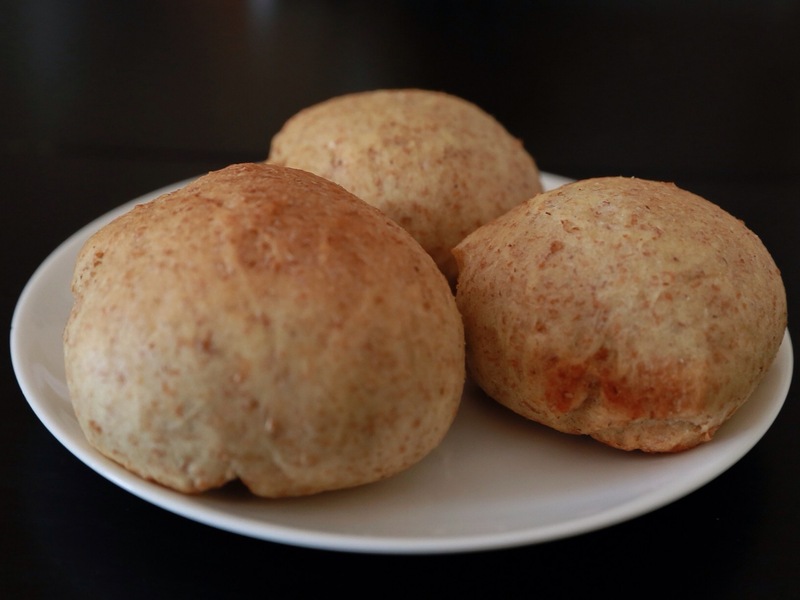 Bread rolls seems easier to be eaten individually and also to share them with neighbours. I was quite worried that the bread will turn out hard as it looked hard on the outside but glad it’s soft on the inside. Best to eat it warm with a slab of butter. 1. Put all the ingredients except the dry yeast into the bread maker pan according to the order above. Put the yeast into the yeast dispenser. Set to the dough making function which in this case, it’s Menu 10 on my bread maker. It will take an hour to complete. 2. Once it’s done, immediately take out the dough and divide into 8-10 balls depending on your size preference and placed on a lightly greased baking pan about 2-3 inches apart. 3. Cover with a dry towel and let it rise for 15mins. 4. Meanwhile, heat up the oven to 190C. 5. Put the baking pan into the oven and bake for 15mins. 6. Once ready, serve it hot with butter or cool the buns down on a rack. Tips: You can even freeze them and heat up it later.